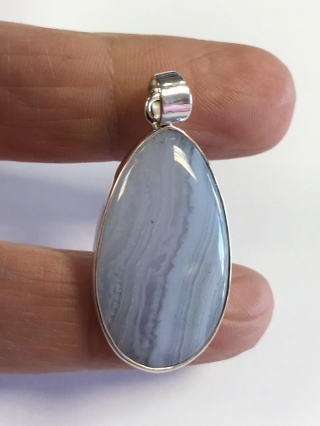 A pretty Blue Lace Agate pendant, set in 925 silver. Blue Lace Agate forms in waves of delicate light blue bands of agate. Its descriptive name is inspired by the specks of white that mottles through the stripes. Like a water colour sky, this crystal instils the calm of waking to an open panoramic space with the freedom to speak and to be relieved of anxiety. It is also used to reduce fever and inflammation.